June 11th till June 13th you are welcome in our booth 12.109. Many existing greenhouses no longer comply with the demands of today’s growers. There is nothing wrong technically with these greenhouses but growing a different crop or looking at cultivation methods from a new perspective has revealed the limitations. Building a completely new greenhouse is a costly investment. Certainly if you compare it with the alternative of lifting the greenhouse: the key specialism of T.C. van den Dool. Since 1934 we have been helping to future-proof growers by modernising their greenhouses. The conditions and technology used to cultivate greenhouse crops continually change. A contemporary greenhouse has a huge air capacity that can compensate better for climate fluctuations. Integrating new installations – such as a second climate screen installation, lighting or irrigation – is often impossible under the current circumstances. An extra cultivation layer or more space to process the crops can also be on a grower’s wish-list. Once the greenhouse has been lifted it is technically completely up to date again. As well as lifting greenhouses, T.C. van den Dool can also renovate them. It can be a financially interesting proposition to renovate the facades at the same time as the height is raised. T.C. van den Dool uses a tried and tested method to lift your greenhouse. A system of pneumatic props is used to gradually lift the greenhouse. These props are interconnected using air lines. Hoists and rising tensioners ensure the stability of the construction is safeguarded during the lifting process. The existing pillars in the greenhouse are replaced by new pillars or lengthened. All the material required to lift the greenhouse is produced by T.C. van den Dool in its own dedicated workshop. We are also responsible for all the engineering the project involves. This approach allows us to respond flexibly to the tight deadlines that a project of this kind always entails. Depending on the location, we work on site with our own team or assign a project supervisor who manages a local team. After completion, you can always rely on T.C. van den Dool for after sales service. a software tool used worldwide to calculate and design greenhouse structures. Your lifted greenhouse therefore also complies with all the standards set by insurers. Do you want to construct a greenhouse outside the Netherlands? Then choose the benefits of T.C. van den Dool’s long experience. We not only export greenhouse materials, we also export complete greenhouses. Based on your requirements, we engineer and produce all the necessary material in-house. And for construction at the final site, we always ensure the availability of a fully trained crew. Using the services of T.C. van den Dool is therefore a highly efficient option for surfaces of one or more hectares. T.C. 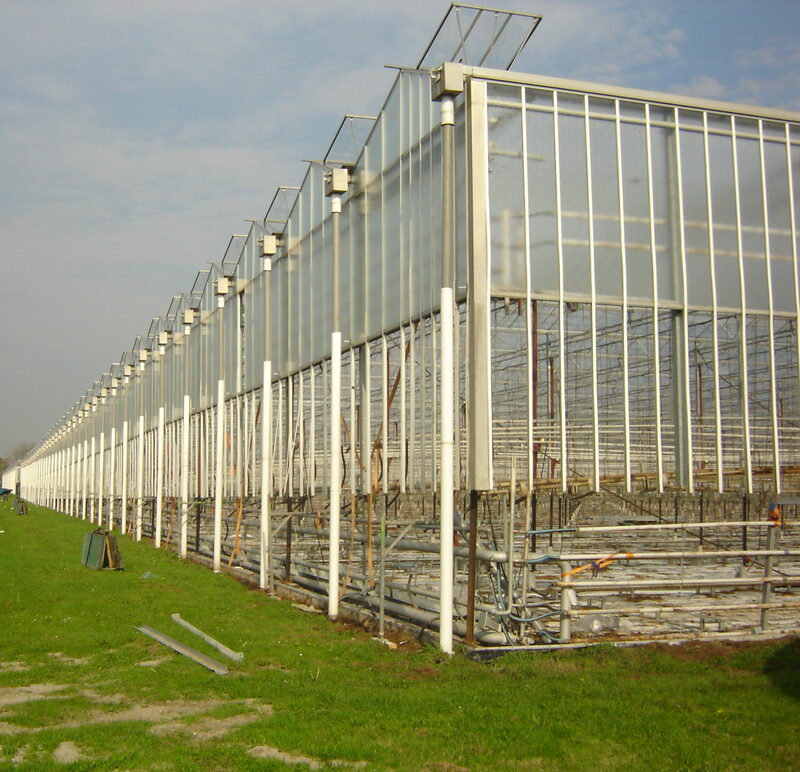 van den Dool has experience with all types of greenhouses, ranging from Venlo type greenhouses to wide-span greenhouses. We have enjoyed an excellent reputation in international horticulture since 1934. And we pride ourselves on being a pleasant partner to work with. What can we do for your greenhouse? The existing grating can be d.m. arm braces are made suitable for hanging cultivation gutters? Props are attached to each pillar in the greenhouse. These props are connected to air cylinders which are connected in turn to a compressed air line. These cylinders lift the greenhouse pneumatically. The greenhouse is lifted row by row until the entire structure reaches the right height. The internal pillars are lengthened or replaced. If necessary, the existing trellis system can be fitted with struts to make it suitable for suspended gutter growing systems.